Last year, Glasser's Interiors used architect Rem Koolhaas's Delirious New York as a launch pad for ideas about human relationships and the boundaries of the self. 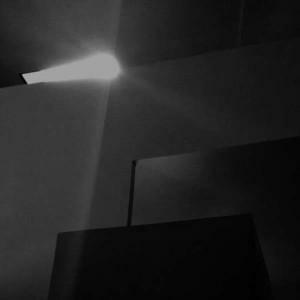 Jon Porras's new album, Light Divide, studies the building sciences on a more fundamental level, through the structure of the compositions themselves: sub-bass as foundation, other elements standing in for support beams and even light passing through. Where Interiors' imposing urban frenzy was a blur of geometrically abstract skyscrapers and brass Trump facades, Light Divide reflects a more 21st century form of placemaking. It sounds like the exurbs at night, a shift-worker's after-hours drive through the hasty construction of an industrial park. Porras, a guitarist in Barn Owl and his solo project Elm, works exclusively with synthesisers on Light Divide, crafting an electronic dark ambient drone record. If it carries a tone of portent, the only looming threat is a bog-standard unknowable dread, a feeling that it's possible to be crushed by both the vastness of space and the oppressiveness of fluorescents pouring down against a building footprint. 'Recollection' evokes distant hums and footsteps in a boxy hallway. The rush of anxiety in 'Divide' is Light Divide's horror-movie moment, with all the chilly alienation of the score for a made-for-cable Canadian thriller set in an empty parking garage. 'New Monument' offers no levity, but breaks up the unrelenting wall of sound from 'Divide' and lets the silence do the scaring. Light Divide is difficult to find one's way into — it's not welcoming, and it's not unwelcoming enough to announce itself with a metal or noise record's sense of authority. It lets the listener in by around the third pass, and even then, with just five tracks that average about six minutes each, it comes to an abrupt end. It's a canny creative choice, leaving people wanting more once the hooks are in: the album continues in the imagination. In the sweat and squeeze of a big-city subway car, it's possible to close your eyes and believe you're lost on the lonesome campus of a mortgage servicer, a single soul under an immense canopy of black.